TROUT: Trout season is in full swing across Southern California urban lakes getting private plants. 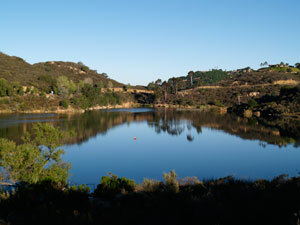 Top picks for this week are Lake Palmdale (a members-only lake in Palmdale) and Apollo Park Lake in Lancaster (stocked this week) in the High Desert. In San Diego county, Dixon Lake, Wohlford, and Jennings are the top bets. Santa Ana River Lakes in Orange County is always a good bet. The San Bernardino County park lakes (Glen Helen, Cucamonga-Guasti, Yucaipa, and Prado) are getting weekly plants and have been fair to good. Silverwood was planted with brown trout again this past Friday. A sleeper pick, better than many local urban waters, is the trout action in the Colorado River near Bullhead City. Limits of 1-pound class fish have been pretty common. In the Sierra, the upper Owens winter catch-and-release bite is perhaps the best bet in the southern half of the state for catch-and-release fishing as the big rainbows run up out of Crowley. Big Bear Lake also has a pretty darn good winter bite for bank anglers again this week.